We will investigate this further with your help to see what might be possible. This issue was never understood. We believe that focus event is fired when focus is moved to a new item and the tracking rectangle does change to show this. see https://i.imgur.com/IDYwgyM.png - narrator's focus is on "Test button", but no focus() event was fired. > This issue was never understood. Sorry, was unaware this was causing confusion. Let me retrospectively add some more information. Specifically, this is about Narrator on a Windows 10 Mobile device. When swiping left/right, setting the reading/accessibility focus, focus)/:focus is not fired. As an example, with Narrator running, open Edge and navigate to https://patrickhlauke.github.io/touch/tests/event-listener.html - then swipe right to set the accessibility focus (indicated by the yellow outline) on the "Test button". focus() is not fired, :focus style is not applied. Only once double-tapping to activate is focus()/:focus triggered. This is particularly noticeable in the case of skip links that are hidden by default and only made visible on :focus. 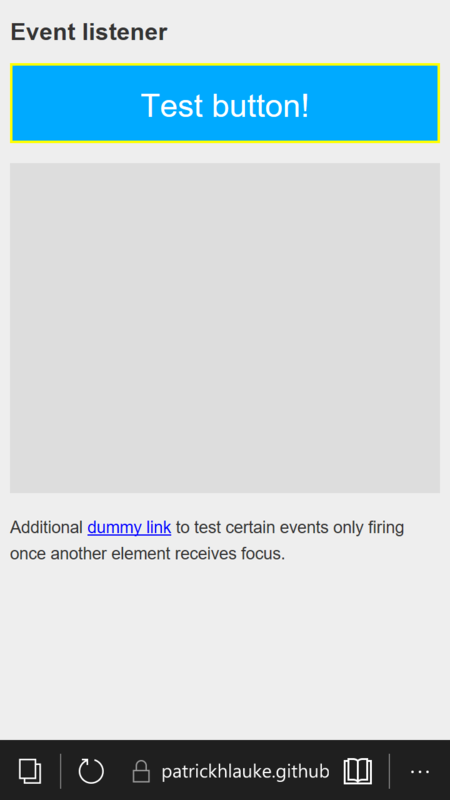 In Safari/VO/iOS, you can swipe to set focus to the hidden skip link, and the :focus styles kick in making it visible. This does not happen in Narrator/Edge/Windows 10 Mobile combo, meaning a (partially) sighted Narrator user won't visually see the skip link (though they can still activate it). At a very high level, the request here is "cursor/focus should follow narrator/accessibility focus (with slight exceptions/special-casing for touch devices where a 'real' focus on a text entry field or similar triggers special behavior/interactions like on-screen keyboards)"